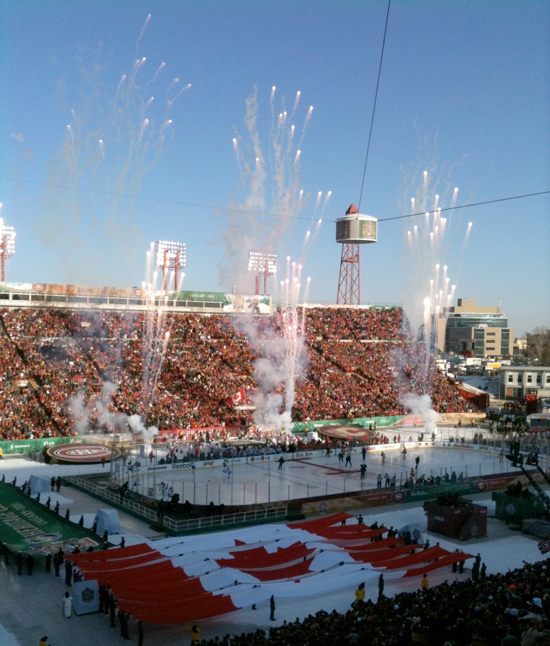 I recently made my way from San Diego to icy cold Calgary to entertain some customers at the 2011 NHL Heritage Classic. Upper Deck invited collectors, hobby shop owners and a distributor sales person to take in a very different type of hockey game. Our good friends at the NHL invited us to a Saturday night party that was just awesome. 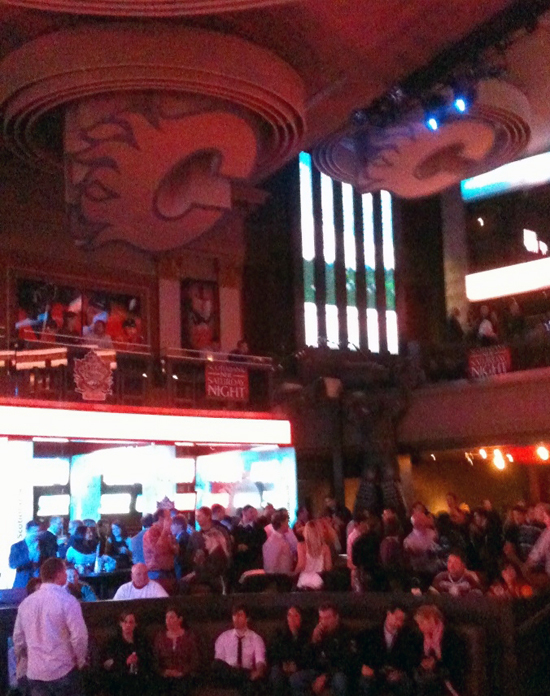 The venue was an old theater that had been converted to a Calgary Flames-themed restaurant. They went all out to make it a memorable night for everybody in attendance. One of the cool parts of the evening was when the band Five for Fighting played as they are actually hockey fans and would share their passion for the sport in between songs. After playing their hit song “Superman (It’s Not Easy)” it was really interesting as the lead singer shared he had become friends with Luc Robitaille and although Luc loved the band, he never realized the name “Five for Fighting” was actually a hockey term. I was able to catch it on video; check it out at the end. After a great evening we got some rest and I was up early the next day looking to visit a local hobby shop. When traveling to new places, it’s always fun to check out different card shops and meeting collectors who you wouldn’t cross paths with otherwise. I was excited to visit Maple Leaf Sports and their store was full of great items that would have any hockey collector drooling. A collector pulled this beautiful Nazem Kadri Rookie Parallel numbered 50/50 while I was in the shop. Boom! I met one collector who was breaking open packs of 2010-11 NHL SP Game-Used and I must have brought some good MoJo as he pulled a double autograph card and this gem, a Nazem Kadri rookie parallel numbered 50/50. Unfortunately I had to keep moving so I made it back to the hotel and caught a bus to the game. 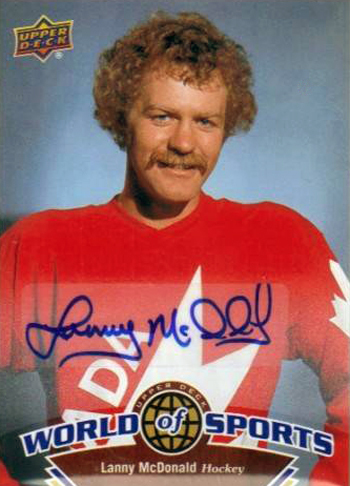 The outdoor matchup pitted the Flames against the Montreal Canadiens and took place at McMahon Stadium in Calgary, Alberta. I dressed as warm as I could and even wrapped some hotel towels to my legs beneath my jeans for extra insulation. There was a real electricity around the stadium as fans flowed in; I even passed hockey legend Don Cherry as I walked in. I found my way to my seat and although I was cold, I felt like I would be able to tough it out. 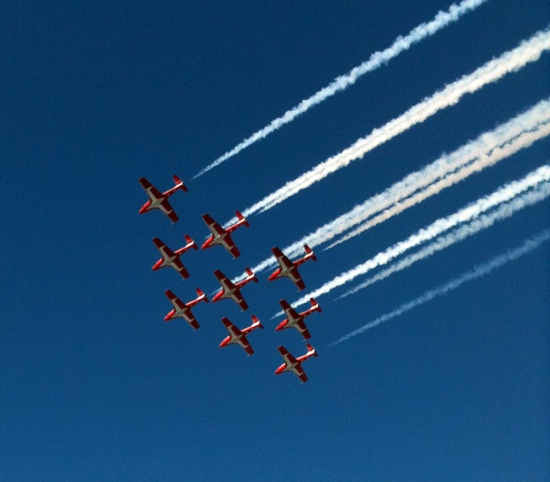 The pregame was awesome and it even included a flyover. Then the action began and the fans in the stands were going nuts with Flames flags flying high. Even though the puck was all over the place due to slightly uneven ice, it didn’t take long for it to find its way past Montreal goaltender Carey Price for the first goal of the game. It was followed by another, and another and another again when it was all said and done. It was a Calgary blowout, but the score did nothing to diminish the fun had by those in attendance however. 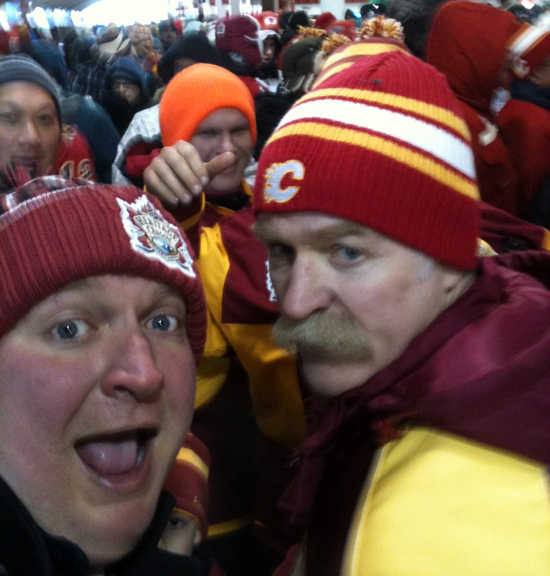 One of my favorite parts of the event was when I was walking to the concession stands and I ran into Calgary Flames legend, Lanny McDonald. I don’t suspect that he was thrilled to take a picture with me, but it was still pretty cool. The toughest part of the game was at the start of the third period, after the sun had completely gone down. It got cold. I’m talking freezing cold. Drinks automatically became Slurpees and it got to the point where you didn’t really care what you looked like, just as long as you could stay warm. I removed one of the towels I had wrapped around my calf and used it almost like a scarf. Again, I didn’t care that I looked like I was a sheik with an affinity for hockey, just as long as I was warm. I was tempted to just purchase a scarf, but for $37 I couldn’t justify it, especially as a guy who lives in southern California. Alright, it is now officially cold! I was 5 minutes away from trying to start a fire in the stands to keep warm at this point. It wasn’t easy to get through the entire game, and I’m still mystified as to why this game didn’t take place at noon, but it was a very memorable experience that I will not soon forget. 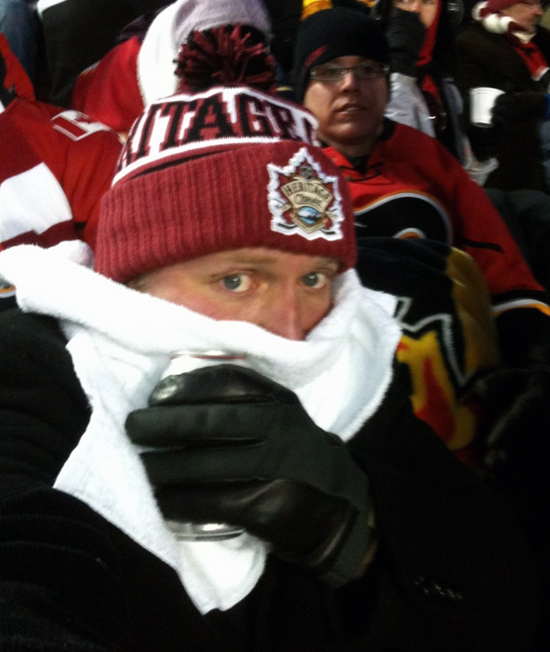 The people of Calgary warmed my heart and the Flames did their home crowd right by taking down the Canadiens 4-0. 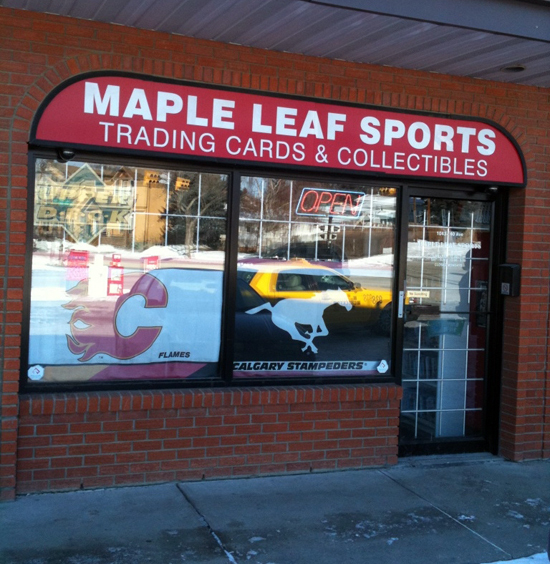 Glad you were able to stop in at Maple Leaf Sports. Darren’s shop is one of best around. Very nice Heritage Classic photo’s. Good get with the pic of the flag and stadium!! !